I’m kicking things off for this project in the “Windy City” of Chicago. But that’s a bit of a misnomer, as the Chicago Fire’s home is actually located a bit outside the city itself, in the suburb of Bridgeview. This location, not as easily accessed as the club’s former home at downtown’s Soldier Field, has been a point of contention since its inception. Many fans believe that moving the club away from the Chicago Loop is to blame for dwindling attendances. All that aside, Toyota Park is still a marvelous place to take in a match. The third soccer specific stadium built for MLS doesn’t really have a bad seat, and it can be a rocking spot on days where fans actually turn out in numbers. Unfortunately for me, I visited the stadium for the Fire’s 6/2 match against struggling DC United on an unseasonably cold and windy day… even by Chicago standards. But thanks to my very gracious hosts — Fire Director of Marketing, Digital & Broadcast Brendan Hannan and Section 8 Chicago — I was able to take in an excellent match and get a really intimate look at Toyota Park. Being one of the largest cities in the country has it perks, as there are ample ways to get to Chicago. Visiting fans can easily fly into one of the two major airports: O’Hare (ORD) and Midway (MDW). While O’Hare is the larger and more prominent airport, Midway is a bit closer to the stadium and offers direct transport to the stadium via the CTA Orange Line. And since most of the budget airlines fly into Midway, it might be your cheaper option, too. Not big on flying? You can also get to Chicago through a number of other options, including train and bus. As for accommodations if you’re staying over night, your options are nearly limitless. Staying within the Loop, closer to downtown will run you at minimum $250 a night, and can push upwards of a $1000. You can can find much cheaper rooms by staying closer to the airports and stadium. From Tri-State Tollway/O’Hare (I-294): Take I-294 and exit at 95th Street EAST towards Harlem (IL Route 43). Proceed about a block, then take ramp to IL Route 43 (Harlem) NORTH. Continue North on Harlem about 3 miles. GENERAL PARKING: STAY IN RIGHT LANE, veer right onto the Frontage Road and beneath the bridge (immediately north of 71st Street). From Midway: Take Cicero Avenue South towards 59th Street for 0.9 miles, and take the third right onto W 55th Street. Stay on W 65th for 3 miles, and run left onto Harlem. Stadium will be on your right. From West: Take I-55 North and exit Harlem Avenue (IL Route 43) SOUTH. Proceed south about 2.4 miles and STAY IN RIGHT LANE. GENERAL PARKING: enter right into “N” lots along Harlem. Only VIP and STH parking may turn right onto 71st Street and enter lots S1 and S2. Concerned about where you should park to get the best tailgate experience? We’ll get to that shortly… but you impatient lot can jump ahead here. Chicago has a world-class public transport system, but for whatever reason, they decided to build the Fire’s home in one of the few spots that system doesn’t really access. Luckily, some the club has stepped up to help fill the gap and help you navigate your way from various corners of the city. CTA Orange Line (Express): Outside of an expensive cab ride, taking the bus is the only public option to complete the final leg of getting to Toyota Park. And while total fare round-trip will run you a cheap $5.50-ish from anywhere in the city with CTA rail/bus access, know that the travel time to the game can take upwards of 2.5 hours depending on where you’re coming from. A “Toyota Park Express” that departs from the Orange Line Midway station every 20 minutes starting two hours before each match. Also, be aware the stop at the corner of 71st and Harlem is nearly a mile walk to the stadium. According to Section 8, it is difficult to catch leaving the airport and near impossible to catch on the way back. But if you’re bound and determined to use public transport, plot your trip using Google. Fire Buses: If you’re the type of fan who likes to pregame at a pub with other supporters, the Fire run a bus-in program with five local pubs. For just $10, you can catch a round trip ticket from one of Atlantic Bar & Grill, AJ Hudsons, Galway Arms, Cleos or Fado. Forking out $30 will also land you a ticket in the Section 8 supporters section, or $35 for tickets to the Miller Lite Party Deck, two beers, popcorn and a hot dog. Reportedly the best option for getting to the game for those in the Northern suburbs and the Loop area. Click here for more info. There’s ample paid parking available at Toyota Park, but as mentioned above, getting there can be tricky. Parking will run you $15/car or $30 an RV, with the lot opening 3 hours before each match. For those wishing to park on the cheap, there aren’t a whole lot of areas within walking distance of the stadium, so you’re probably best off paying. The Section 8 Tailgate as it winds down before kickoff. An awesome ambulance decked out in Fire paraphernalia at the Section 8 Tailgate. Inside the awesome Fire ambulance at the Section 8 Tailgate. The tailgates are extremely important to the Section as it is not only the ideal place to socialize with friends and fans, but helps develop the culture for hardcores bringing their friends to their first game or long time casual Fire fans wanting to check out the dedicated supporter lifestyle. The atmosphere can be intimidating, especially for the socially tentative, but welcoming for those that wish to immerse themselves in the carefully orchestrated chaos of Section 8 Chicago. Chicago has one of the best soccer bar scenes in the country, and finding a spot to pregame at prior to going to a game is not only easy, but even promoted. As mentioned above, five bars — Atlantic Bar & Grill, AJ Hudsons, Galway Arms, Cleos and Fado — offer bus service to and from Toyota Park, and those have become Section 8‘s preferred spots to hit up before and after matches. They also make for great bars to take in away matches with fans. And just in case you just want to watch the game from ANY local soccer-friendly bar, check the Chicagoland area listings in the WSOTP Soccer Pub Atlas. Tickets for Fire games (available through the club website) are generally pretty affordable, especially when compared to other Chicago sporting events. Single game tickets run anywhere from $20 in the upper deck (called the Skyway) and supporters section (called the Harlem End) to the $70 for midfield club seats. Decent seats in the lower bowl can be had for as low as $28 in the corner sections of 103, 111, 124 and 132. See the stadium seating chart. Will Call, along with walk up ticket sales, is located on the East side of the stadium. despite the uncomfortable weather, section 8 still filled the harlem end and brought some much needed energy to the match. 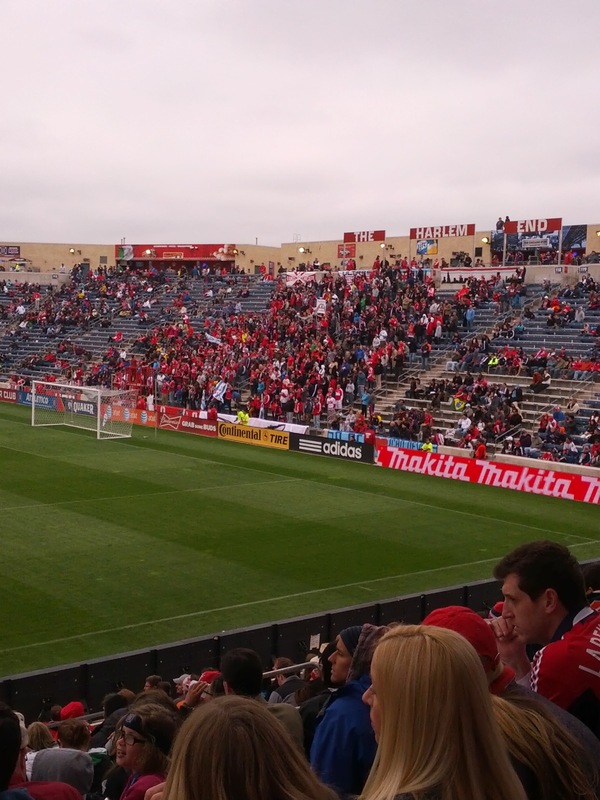 Even if it’s your first trip to Toyota Park, you’ll quickly be able to figure out the location of the primary supporters section due to the constant buzz emanating from the Harlem End on the North side of the stadium. Located primarily in Sections 117 and 118, Section 8 offers a vibrant and passionate fan experience. If you plan on sitting here, expect constant singing, flag waving and jumping about. A secondary home supporters section can also be found in Section 101, where Sector Latino takes up residence. Traveling in to support your team from out-of-town? Visiting fans are asked to sit in the opposite corner in the South end of the stadium in Section 134. Toyota Park offers 42 executive suites, most of which are located on the East side of the stadium above sections 124-132. There are also six suites located on the stage at the South end. A majority of them are corporately-leased on a yearly basis, though some are available on a per game basis. Each suite can accommodate up to 36 guests, and provides VIP parking, catering services, a private host and access to the post-game Stadium Club. Contact Fan Relations at 888-MLS-FIRE or fanrelations@chicago-fire.com to inquire about availability. The entrance to the ritzy Second Star Club. All inclusive dining comes as a part of the package when you sit in the Second Star Club. The indoor view from the Second Star Club. A shot of the all-inclusive bar at the Second Star club (plus the pre-shift meeting). And while the suites are nice, there is one other spot in the stadium that offers the ultimate viewing experience at Toyota Park: The Second Star Club. Spanning the top of Sections 127-129, this luxury offering features private, all-inclusive dining and drinks, premier parking a private entrance and the chance to mingle with Fire players and technical staff before and after the match. As you might expect, you pay the price for such fine accommodations: $300 for a single game seat. Other seating options exist as well. The South end stage doubles as the Miller Lite Party Deck on match days, and a $30 ticket nets you two beers, a hot dog, popcorn, a trip to-and-from the stadium from participating pubs and access. For those looking to get even closer to the action, premium field side seats are also available for $225 along the Southeast corner of the pitch. Section 8 recommendations? Give a try to Connie’s Pizza — said to be “vastly underrated in the great Chicago pizza debate” — or have a Chicago hot dog with all of the proper fixings — sweet relish, mustard, onion, tomato, cucumber, celery salt on a poppy seed bun and hold the ketchup. Check out Hot Time in Old Town‘s concession breakdown a look for a super in-depth rundown on stuffing your face at Toyota Park. If you’re feeling thirsty, you’ve got a decent selection to wet your whistle. Standard macros of both American and Mexican variety are to be expected at most of the concessions. However, a few standalone vendors offer local drafts from Lagunitas Brewing (WSOTP endorses their IPA) and imports from Poland’s Zywiec. Like nearly all MLS clubs, the Fire are attempting to draw in new fans. And a big part of that outreach is to entice fans with activities and events before and after matches. Just like other pro sports franchises, the club schedules several entry giveaways throughout the year — such as the upcoming fan-voted Bobblehead Night. Post-match concerts and international friendlies are other frequent draws, especially during the warmer summer months. For those fans looking to soak in the fan experience pre-match, but don’t want to tailgate, be sure to check out the family friendly Quaker Firefest. Located outside the gates on the Northeast corner of the stadium, you and younger Fire fans can take part in activities ranging from small-sided games, testing your shot speed, face painting to blow up obstacle courses. The majority of the Fire’s weekly training actually takes place at Toyota Park, where two separate practice pitches sit adjacent to the Northwest side of the stadium: the closest is an artificial pitch, while the second grass pitch sits behind a privacy fence further back. Both can easily be viewed during match days and are just a short walk away from the Section 8 tailgate. The practice pitches at Toyota Park. Looking back up the tunnel at the East stand of Toyota Park. Unfortunately, I wasn’t able to go in and snap pictures of the Fire locker and training room on match day due to my arrival time at the stadium. Luckily, I’ve visited them before. The locker room itself is pretty standard, with each player having a large open locker and a “comfy” folding padded chair in front of it. The training room features several ice baths and training tables where players receive treatment prior to and after matches. Each is wrapped in visages of fans and inspiring quotes to remind the players they’re playing not just of themselves and the club, but also the supporters. And as they’re about to take the pitch, they walk down a tunnel that features a Notre Dame-esque sign and chunk of the old “Section 8” from soldier field which the players touch for good luck. The pitch at Toyota Park, regularly regarded as one of the best in the league, is a sight to behold in person. A $1.7 million turf management system including full heating, drainage, and aeration capabilities is used to maintain the gorgeous 120 yards long by 75 yards wide bluegrass pitch. The turf itself was a little moist prior to the match against DC United thanks to the previous night’s monsoon, so I wasn’t able to spend much time on the 5/8th of an inch long turf — something that surely kept the grounds crew happy. Ever wanted to know what it was like to be a player getting ready to make his debut for the Fire at Toyota Park? Be sure to check out the WSOTP Pitch Pass for an interactive exclusive panoramic from field level! Click to launch. Want a chance to meet your Fire heroes or snag an autograph? Luckily at Toyota Park, there are a few ways to do so. It’s sometimes possible to snare an autograph along the edge of the playing field prior to or during a match, but access is dependent on the tickets you’ve bought. Purchasing Club, Suite or Second Star Club seats grants you access to the Stadium Club after the match, where you’ll have the chance to interact with and meet players and coaching staff. (Another cool aspect of getting access to the Stadium Club is you get to watch the post-match press conference live and in person.) Additionally, members of the Fire’s free Kids Club have an opportunity to meet players once a season. Also, be sure to check the club’s appearance schedule for a chance to see players out in the wilds of Chicago. In every stadium that I visit, I try to uncover one “hidden” aspect of the stadium that most fans don’t know is there. And after visiting Toyota Park, I definitely would want to recommend visiting the Illinois Soccer Hall of Fame. Located on two walls behind Sections 132 and 133, you’ll see placards for the state’s best players, as well as a trophy cabinet housing all sorts of cool memorabilia from yesteryear. Thanks for reading my review of the Chicago Fire’s Toyota Park! Have a suggestion or see an inaccuracy? Be sure to reach out to me at wrongsideofthepond@gmail.com. Next Post: who needs a revolution when there’s evolution? One tip: there’s a Mexican restaurant opposite the SE corner of the stadium. Highly recommended for pre- or post-game tacos washed down with horchata. ekse havijg identical RSS problems? Anyone wwho knows the answer will youu kindly respond? except this weblog provides quality based writing. My husband & son are going to a Sat afternoon game. Is there anything for a teenage girl & mom to do that is close by? I’m going to a game 1st time with my 11 year old son. I have found two seats that look very good but not sure. They are in section 205, row 9 on the isle but near an indentation like feature in the upper deck. I love these seats but for two things which might turn me off. A) Does that indentation part obscure the view of the further end of the pitch? B) There seems to be a glass or Plastic wall between the deck and the field. Does this get annoying trying to look through it during game action? I’m not picky but this is a once in a lifetime experience for my son. We live way down in the Caribbean and have no stadiums like this. There are more expensive seats without the issues i mentioned and I’ll pay but I really like the idea of those in the upper deck. One more thing, by the looks of the seat chart there are no seats in front of these two either even though its about 9 rows up. Any help would be great. Thanks for your posting. I would like to say that the very first thing you will need to perform is determine whether you really need repairing credit. To do that you will have to get your hands on a duplicate of your credit score. That should really not be difficult, since the government makes it necessary that you are allowed to be issued one absolutely free copy of your real credit report on a yearly basis. You just have to request the right people. You can either read the website for your Federal Trade Commission or even contact one of the main credit agencies instantly.